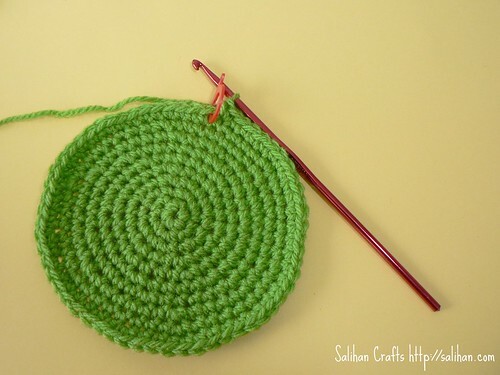 A tawashi is a Japanese traditional scrubbing brush. 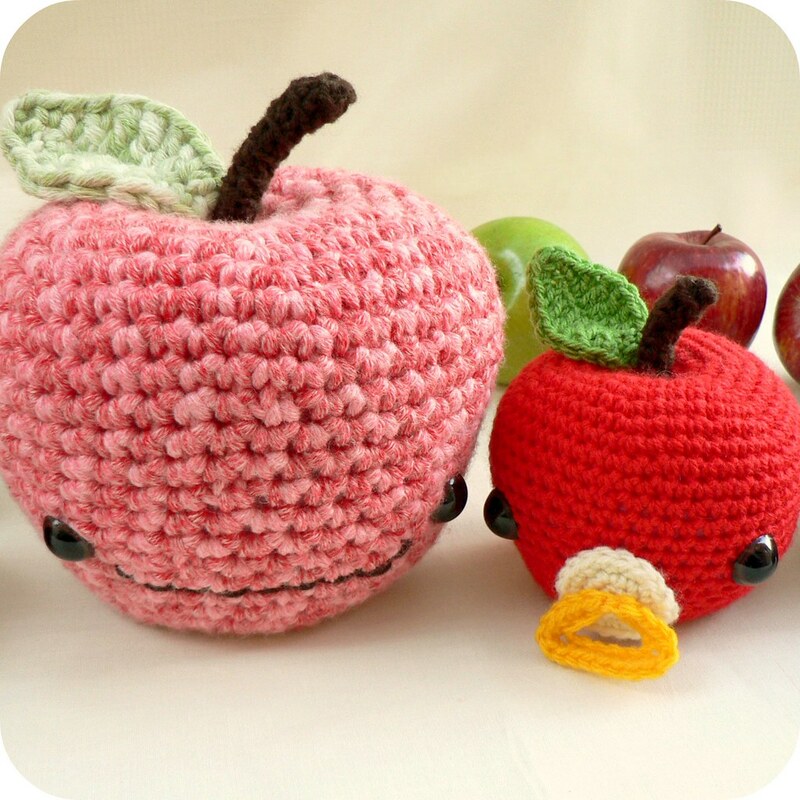 But there is nothing traditional about my crocheted Pear Tawashi! 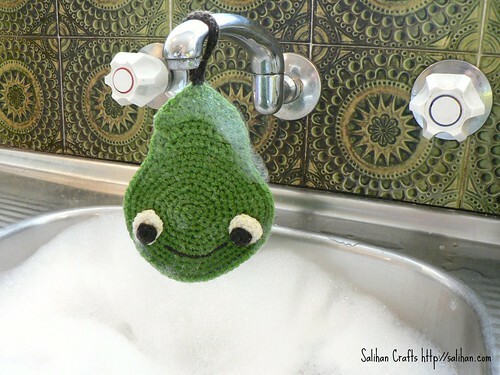 This scrubber is crocheted with acrylic yarn and dries a lot quicker than the cotton knitted ones, like my Hubby’s Favourite Dishcloths (Ravelry). It is a print friendly PDF and has minimal pictures. Using brown yarn, chain 2. 6 sc into the 1st chain. Slip st into 1st sc. Fasten off and leave a long tail. Make another one. 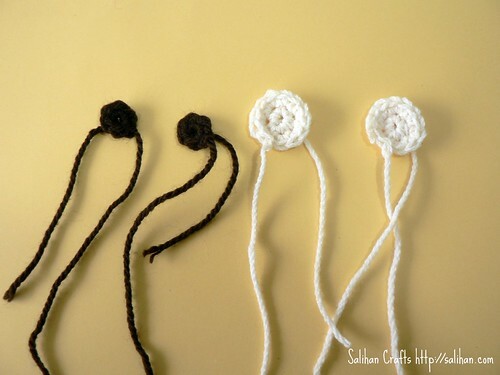 Using white yarn, chain 2. 6 sc into the 1st chain. 2 sc into each st (12 sts). Slip st into 1st sc. Fasten off and leave a long tail. Make another one. 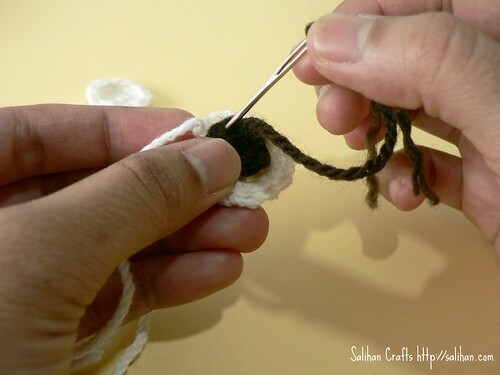 Using an embroidery needle, sew brown circles onto white one using the long tails. 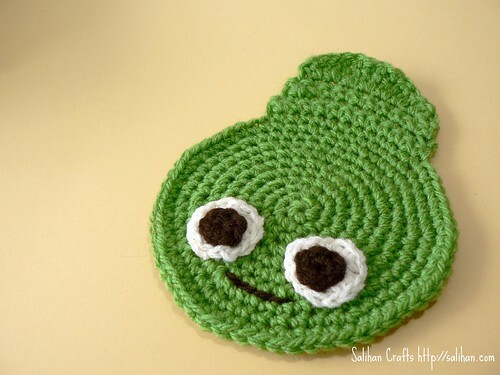 Using green yarn, chain 2. 6 sc into the 1st chain. Mark the first stitch of the next round with a removable stitch marker. 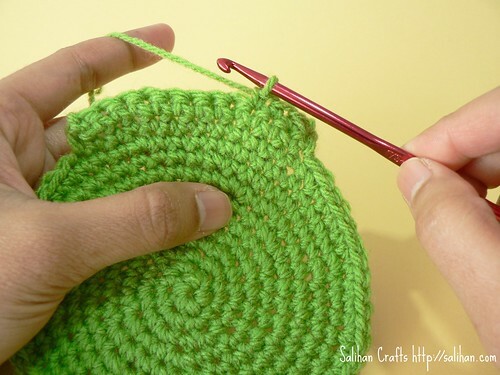 Reposition the marker at the beginning of each round to mark the new first stitch. Do not turn or join rounds until told to do so. If you do not see the video above, click HERE to watch directly on YouTube. 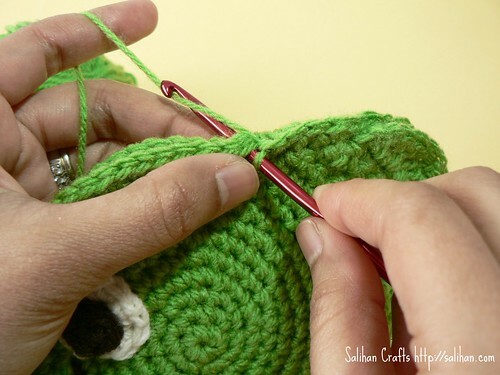 Fasten off and weave in ends. 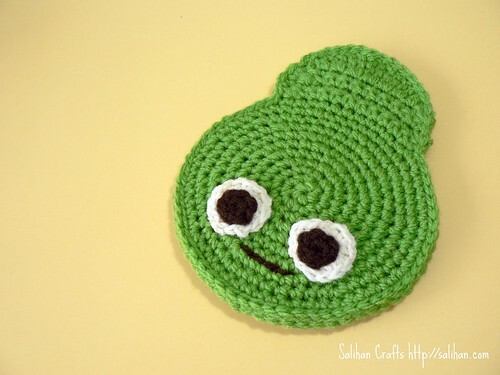 Using an embroidery needle, sew eyes onto pear. 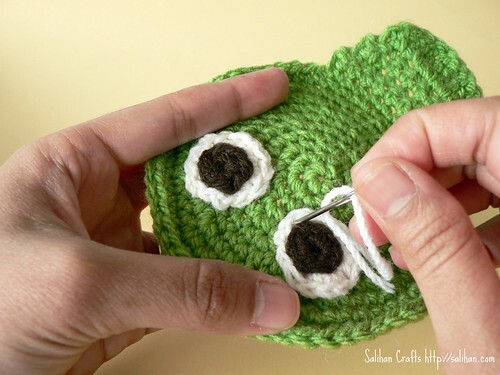 Embroider a mouth using brown yarn. 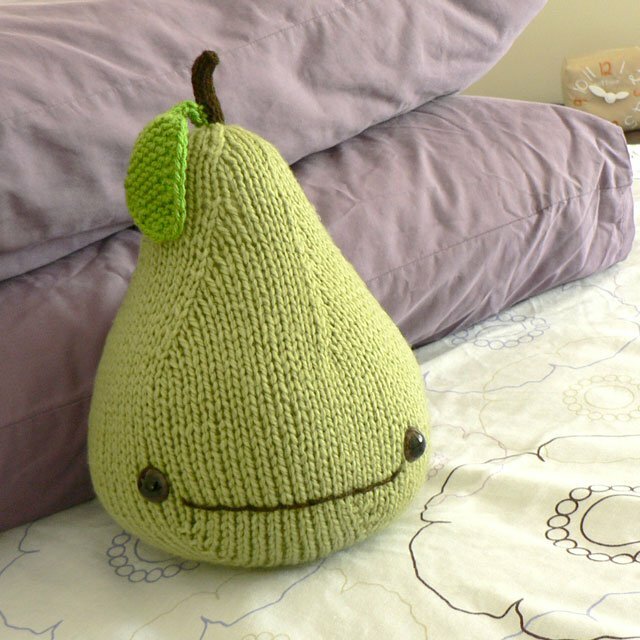 Make another pear. When completed, do not fasten off. Weave in loose end. 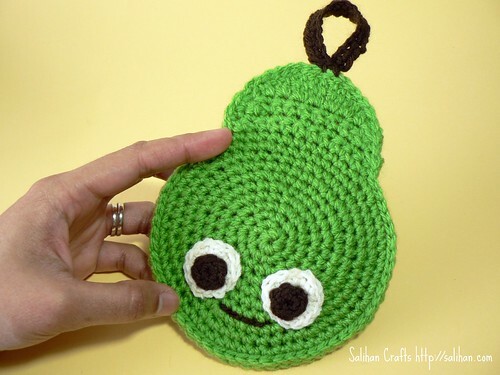 Placing wrong sides of pears together, slip st around the edges of both pears using the working yarn and hook. 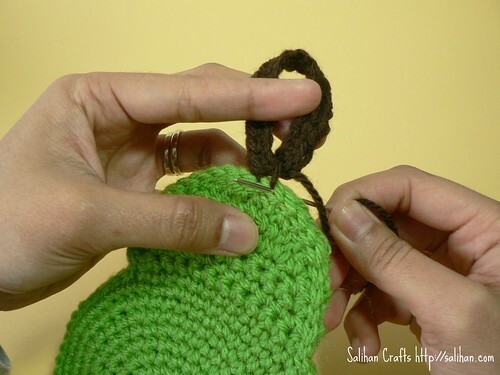 Using brown yarn, chain 19. Skip first chain (closest to the hook), 1 sc into 18 chains. Fasten off, leaving a long tail about 6″/ 15cm long. Weave in loose end. 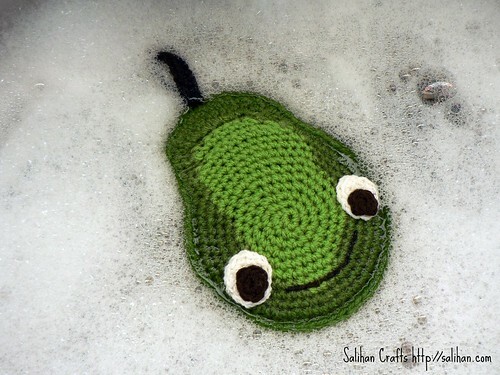 Attach stem to the top of the pear using the long tail and an embroidery needle.